Solar home improvements are the way forward for many people who seek a greener lifestyle and real savings on fuel. There are now quite a lot of different solar technologies for the home. This page explores some of the commonest ones. Here is a run down of some home improvements using solar technology that you could consider which are available on the market today. They are explained from the most expensive to the cheapest. I've only included fairly well established solar home improvements, including solar thermal, solar PV and passive solar gain technologies. This is just a brief introduction to the topic of solar home improvement possibilities. See other pages in Green Energy - Solar Power for Homes for more details of some of these ways of harnessing the power of the sun in your home. Of all the common solar home improvements, photovoltaic cells are perhaps the most expensive - though as they gain in popularity, prices are coming down quite steeply. They also have a relatively long pay-back time, typically more than seven years in the UK. Photovoltaic or PV arrays are made of silicon-based cells which induce a weak electric current which can be used to power many of the electrical devices of the modern home. However they are unlikely to supply enough energy for the more power-hungry machines such as washing machines and tumble dryers. The cells in a PV array are made up of semiconductors. These are generally made of silicon. As "photons" of light from the sun hit the array they make electrons within the cell come loose from their atomic bonds and start to flow as a weak electric current. This current is channelled by conductors (metal) to run to where it can be converted into Alternating Current (AC) for domestic use. Solar arrays collect energy as DC (direct current). This solar power experiment demonstrates the limits of PV - picture thanks to David.nikonvscanon. Many linked solar modules (groups of cells within an array) provide a usable flow of current - but only when sunlight is falling on the array. There is still a small electric current even when the sun is not shining if the cloud cover is still fairly bright. This is caused by radiant energy from the sun. But by far the best results occur from full sunlight. At night the current stops altogether. As most people's energy demands are not confined to daylight hours, PV electrical energy has to be stored, (or put back into the energy grid). Many domestic systems rely on heavy-duty batteries to store the electrical energy produced for use later. Certainly, if you want to live off-grid, you will need to invest in several large batteries and still be very economical with your energy use. You almost certainly will be unable to power a washing machine. Integrated systems are available which let you take energy from the grid when you need it and put energy into the grid when you have too much for your own needs. In general, the larger the solar array, the more electricity can be provided. Most solar arrays for domestic installations consist of one or more rigid panels placed on the roof. The best roof for sunlight exposure is used, considering both direction of light and the aspect. For solar arrays to work, a clear line of sight to the sun is needed for most of the day. PV systems will usually need an "inverter" to change the DC current to AC. In some countries it is possible to sell unused power back to the grid by "net metering". The amount of money saved by this means is usually small. There is now some pressure from consumer and green groups for a better net metering rate to be adopted by energy providers so that more people are encouraged to use PV. Solar home improvements such as PV need careful thought and costing. To get a worthwhile solar array installed is expensive and will almost certainly not supply you with all the power you need. It's important to remember that many days cloud cover will stop the solar array from working effectively. Even a small amount of shadow hitting just part of an array can severely limit the energy produced. 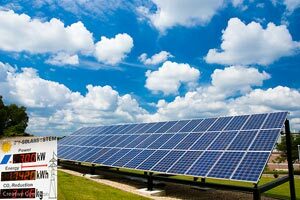 Most solar arrays in temperate regions do not manage to generate much more than 10 watts per square foot of roof covered. An average home is likely to need several Kilowatts of power at peak times (remember a simple plug-in room heater generally uses 1-3 Kilowatts per hour). The technology of PV is expensive and requires considerable investment from large companies. It is best to buy from a reputable, licensed distributor and installer. If you buy outside of these networks you may be left with an inadequate or faulty system which is expensive to repair. Passive solar gain - free warmth! Passive solar gain is a solar home improvement which will increase your home's comfort and efficiency and will save you lots on fuel bills - over time. What is passive solar energy? It is the heat energy stored in the house itself, in the bricks and mortar and other building materials. During the day the sun heats the house. During the evening and night the warmth is retained to warm the occupants until the next day. there are tried and tested methods for improving the solar gain of buildings but this is not generally something you can do once the house is built. The capacity for solar gain needs to be inbuilt at the design stage. Solar gain is only worth considering (as an investment) if you are adding an extension or re-modelling your home in a fairly radical way. If you plan an new room, then get an architect or builder who can maximise solar gain as part of the design. This is a method which is very well advanced in Scandinavian countries and is increasingly being used by savvy builders and designers around the world. A well designed new-build home can exploit solar gain so that the house remains warm longer than otherwise. Combined with sophisticated cooling systems, solar gain offers flexibility and efficiency. Using solar gain is far from new: the ancient Greeks and the Romans knew about using the sun for maximum warmth. Streets were often built running east to west so that every building could benefit from a large sunny space to trap warmth in the stone during the day. The back of the house (north side) would be built against the hillside for keeping a cool mean temperature in the hot part of the day. Many showcase modern eco-houses have been built incorporating these principles together with sophisticated natural cooling systems. Some even manage to maintain a fairly constant year-round temperature without recourse to any fossil fuels! One such house has maintained an indoor temperature of over 65 degrees F since it was built in 1991. This kind of house is sometimes called a passive house. There are examples in Europe, too. We all use passive solar gain in our houses a little bit. Good quality curtains and blinds can help us to maximise warmth in the home after the sun has set, for example. A greenhouse or a conservatory added to the house can be a source of passive solar gain in the winter and will benefit the house as a whole. Thought needs to be given to ventilation and cooling in the summer months; the solar gain from greenhouses and conservatories can be far too much in warm weather. Passive solar gain is one of the solar home improvements which can be very expensive, depending on what you are trying to achieve. But if you are already planning some changes to your house, harnessing passive solar gain in your favour will pay back year after year. Solar thermal systems are a worth while investment for many people. The sun is used to heat domestic water - either directly or by proxy, though panels on the roof. Solar thermal systems are increasingly sophisticated and can be fully integrated into a domestic hot water system to enable years of almost free hot water. The hot water provided may be enough for all the family's needs during the summer months and will provide a useful pre-heating to supplement other heating methods during the winter. They can often pay for themselves over a period of around 15 years or less. Please see Green Energy - Solar Power for Homes for detail on solar thermal systems. Solar lighting has become an established feature of garden centres and DIY outlets. Good quality solar lighting can be a very practical to illuminate outside areas after dark. Solar lights rely upon a small solar PV panel to collect energy during daylight hours. The size of the panel and the efficiency of the storage will affect how long the device works for after dark. Many of the cheaper solar lights are flimsy and insubstantial and do not appear to offer a serious addition to the household, beyond a certain novelty value. If you want to be green, avoid instant landfill! See Green Energy - Solar Power for Homes for more details on some of these solar home improvements.